PDA legislators during the launch of election campaign for 26-Aonglenden assembly constituency in Ungma on Friday. Mokokchung, March (EMN): Chief Minister Neiphiu Rio on Friday asserted there is “high hope” towards solving the Naga political issue if there is a “strong leader like Narendra Modi” running the affairs in India. The chief minister said this during the launch of political campaign of Sharingain Longkumer, the PDA’s consensus candidate for the 26-Aonglenden assembly constituency by-election, at Ungma village in Mokokchung district. According to him, the expected settlement to the Indo-Naga political talks would be equivalent to the Naga people coming out of darkness to light. It will secure a better future and opportunities for the Naga youth, he asserted. Rio also predicted that BJP-led NDA government will come to power for the consecutive term under the leadership of Prime Minister Narendra Modi. Citing surveys conducted by “national papers”, he said that the BJP is expected to secure an absolute majority of 282 seats in this ensuing parliamentary election. Rio also claimed that Modi wave is becoming “bigger and bigger” after India retaliated with airstrikes deep inside Pakistan territory in retaliation to the terror attack In Jammu and Kashmir. “This has proven the strong and decisive leadership of Modi,” he said. According to the chief minister, the BJP coming to power again in the Centre will ensure check in corrupt activities; and rise in developmental activities and defence against external aggression. On the issue of Citizenship Bill, the chief minister pointed out that the PDA cabinet took the decision to oppose the Bill after consultation with the tribe hohos, civil societies and political parties. He, however, pointed out that only the NPF and the Congress did not attend the consultative meeting. The chief minister further alleged the main opposition boycotted and walked out from the Assembly when a resolution to strengthen and implement the Inner Line Permit in the entire state of Nagaland, including Dimapur district, was to be passed. “Therefore, the opposition NPF leaders have no vision, no political decision and they have no thoughts to protect the Naga people,” he said. Rio also claimed that the opposition NPF was divided over the Lok Sabha polls—one group wants to set the party’s candidate while another wants to support the Congress candidate. “I observe that they will not set up the candidate and when they support the Congress candidate, NPF MLAs and supporters might declare their support to the PDA consensus candidate,” he suggested. “They have not done their homework; if leadership does not set up its own party candidate, what kind of leader is that? What is the reason?” he asked. He also claimed that the position of PDA consensus candidate for Lok Sabha is bright. The chief minister also reminded that the PDA consensus candidate for 26-Aonglenden assembly constituency by-election, Sharingain Longkumer, has the alliance’s support after securing the NDPP’s ticket. 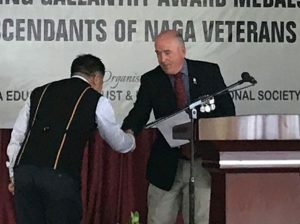 “The youngest should take the leadership to look after the welfare of the Naga people; I have high hopes in Sharingain—he is young, our vision is to make him a leader for the Nagas,” he said while explaining the party’s reason to give Longkumer the ticket. In this connection, he urged the people of Ungma village to ensure conduct of elections in a fair and free manner; and desist from indulging on “khel and clan politics” in order to allow voters to exercise their rights. He also expressed confidence that the voters of 26 Aonglenden assembly constituency will elect the PDA consensus candidates for Lok Sabha and by-election. Deputy Chief Minister Y Patton; minister and the president of BJP Nagaland Temjen Imna Along; the president of NDPP, Chingwang Konyak; ministers G Kaito Aye, Tongpang Ozukum, Metsubo Jamir; advisors Imnatiba, Dr. Longrineken and Supo Jamir also spoke during the campaign.